Jamie Wilson stands in her future bedroom in her Habitat for Humanity home in Carbondale on Wednesday. The south-facing room provides drop-dead gorgeous views of Mount Sopris. Wilson said the home construction has been such a rewarding experience because of the volunteer labor provided by friends as well as strangers. It’s a community effort. Wilson is a member of Defiance CrossFit in Glenwood Springs. Several people she works out with at 5 a.m. are in the construction trades and have chipped in with work. Thad Eshelman, for example, brought a framing crew that put up the roof. “The fact that it’s going to be a home for us — I don’t know that I’d trade this for a mansion in Aspen,” Wilson added. Wilson, 31, can be considered the face of the imperiled middle class of the Roaring Fork Valley. 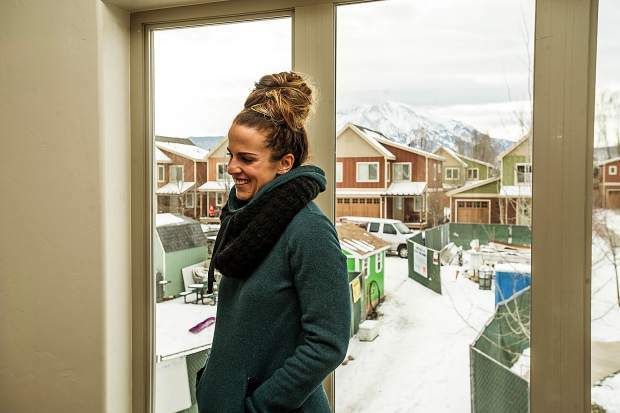 She grew up in Glenwood Springs but was in danger of being priced out of the place that she called home. But in the Roaring Fork Valley they are facing the “Cliff Effect.” Wilson’s income is too high for them to qualify for government assistance, yet the high cost of housing forces the family to live paycheck to paycheck. Wilson said in years past she’s been forced to make tough decisions between staying current on student loan payments, paying rent or getting Christmas presents for her kids. She doesn’t feel her situation is unique. “Most of the people I grew up with can’t afford to stay,” she said. She sees it as the most critical issue facing the valley, from Aspen to Glenwood Springs. Critical workers such as nurses and teachers can’t get a foothold because of the high cost of housing. The revolving door affects the quality of education and the ability to properly staff essential health care operations. Wilson previously worked for the Nurse Family Partnership, a voluntary program for low-income, first-time mothers. She worked with 27 families from Aspen to Glenwood Springs and learned firsthand the hardships many families are facing. Some moms had no home to return to once they delivered their babies, she said. While researching the qualifications necessary to apply for a Habitat house for some of the people she was helping, Wilson was encouraged by friends to apply herself. She was reluctant at first, believing her family was doing well enough and, frankly, not sure she wanted to accept the aid. She decided to apply for the benefit of her kids. Despite the challenges to living here, they have a huge network of support from family and friends. “I would do anything not to take them out of that,” she said. When she took a closer look at the qualifications, she realized a Habitat house is “a hand up, not a hand out,” as the organization’s motto goes. “Nothing has been given but the opportunity,” Wilson said. She applied, had her finances thoroughly examined to make sure she could afford the house and was interviewed by a selection committee. After a couple of torturous months of waiting, she learned she was selected. Construction commenced in July on a three-bedroom, 2½-bath home at Keator Grove subdivision in Carbondale. Scott Gilbert, the Habitat chapter president, said the Wilson family is exactly the type of Roaring Fork Valley resident they want to help. The single mom with three kids is in a “vortex” where they have enough money to survive, but they would never be able to afford a house. Habitat has targeted the valley’s middle class to assist. “We’re not looking for the neediest family,” he said. They are looking for families who can afford homeownership under the terms Habitat can offer. Gilbert said he’s been amazed at the number of Wilson’s friends, particularly those with construction skills, who have committed time to the project. “We’re always trying to find people that the community wants to rally around,” he said. Adults in the households that receive a house must contribute at least 250 hours of sweat equity. “I’ve far surpassed that,” Wilson said. The house appraised at about $500,000. Wilson will pay about $260,000, according to Gilbert. Habitat’s rules are that the principal and interest on the mortgage payment plus the taxes and insurance cannot exceed 28 percent of the household’s gross income.